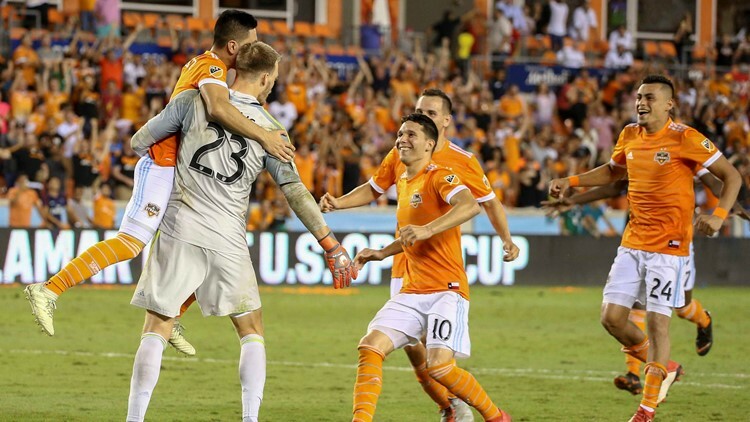 The Dynamo will host the Philadelphia Union in the Final at BBVA Compass Stadium on Wednesday, Sept. 26, with kickoff scheduled for 7 p.m.
HOUSTON – Tickets to see the Houston Dynamo in the 2018 Lamar Hunt U.S. Open Cup Final are on sale now. This not only marks the first trip to the Open Cup Final in Dynamo history, but also the first tournament final to be played in Houston in club history. The club won the MLS Cup in 2006 and 2007, and played in the MLS Cup Final in 2011 and 2012, but none of those matches were held in Houston. Across all sports, this represents just the seventh opportunity for a Houston professional team to raise a championship trophy at home, and the first in any sport other than basketball. The Houston Comets won the deciding game in each of their four WNBA Championships in Houston, and the Houston Rockets won the deciding games of the 1994 and 1995 NBA Finals at The Summit. This is the Dynamo’s first trip to the Open Cup Final. Houston advanced to the Final by defeating the Los Angeles Football Club 7-6 on penalty kicks on Aug. 8. The teams played to a 3-3 draw in regulation and then fought to a stalemate over two extra-time periods, sending the match to penalties. Goalkeeper Joe Willis made two saves in the shootout, including the match-winning save in the eighth round of attempts. Dynamo field players converted seven of their eight penalty attempts to secure a spot in the final. The Lamar Hunt U.S. Open Cup is a single-elimination tournament to determine the champion of American soccer. Teams from every level of soccer are included, from local amateur and semi-pro sides up to Major League Soccer. Each MLS club received a bye until the fourth round of the tournament. Founded in 1914, the Open Cup is the oldest national soccer competition in the United States and the second-oldest team championship in American sports. The 2018 tournament is the 105th edition of the competition. Tap here for more info on tickets.